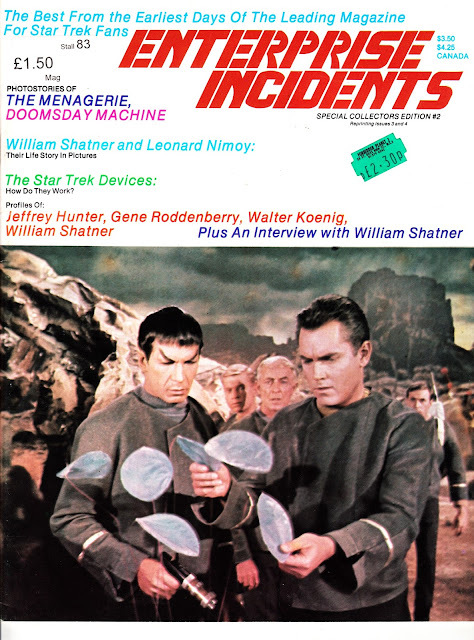 From January 1984: the second (of six) issue of ENTERPRISE INCIDENTS SPECIAL COLLECTORS EDITION, reprinting (from the late Seventies) issues 3 & 4 of the original fanzine. Note the nostalgic Forbidden Planet 2 green price sticker (see my other post today for more) and apologies for the dealer sticker top-left. forever and ever Steed, I have many fond memories of playing the new avengers board game with my cousin back in the 70's.